The skies and the vast air waves of this oceanic multimedia storm we constantly live in have recently produced a small flurry of extremely high quality hip hop music. You'd have to really be paying attention to the wavelengths of the underground in order to catch it but if you attempt to tune into it, trust me, it's there. Superb, pure, artistic and intellectually rich hip hop music still exists. It really never died when its so-called "Golden Era" faded, instead it has burrowed deep into the underground to save itself from extinction during this growing catastrophe that is the violent spreading of brain-numbing, simple-minded, McDonalds Happy Meal, commercially-skewed cheap pop music branding itself as "hip hop" or "rap". Music that was made simply to tap into someone's baser emotions (greed, instant gratification) so that they become practically hypnotized by a simple, repetitive two-note computer fart and crave its noise to the point of making it one's ringtone is not hip hop. I will eventually write an argument of mine in which I posit that the highest version of what we call "hip hop" (basically, poetry over rhythmic beats), a version which I believe reached its height of popularity in the mid-90s, just might be the greatest art form ever. This version, which has for a while now persisted in the underground sphere of hip hop, continues to produce incredible artists but so few people know about them. A suffocating, freshly-tarred pavement slab has covered over the monuments of hip hop's Golden Era like a new set of condos being placed on top of an enormous old art museum. The mainstream of society stopped hearing from and seeing (real) hip hop and gave up on it ever coming back again but that heart still beats. I'll show you some examples of it here. You'll be surprised how well it's doing. Just over the last 6 months or so, but especially these last few weeks, we've been seeing the skies rain delicious jams and great albums. I'll start with the one I have been anticipating the most. 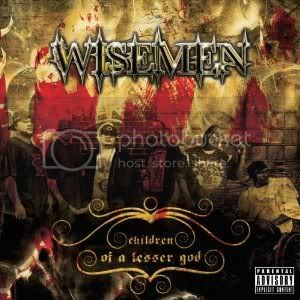 The blossoming Wu-Tang farm system prospect, the musical and lyrical mastermind known as Bronze Nazareth, along with his similarly multi-talented brother Kevlaar 7, and their crew the Wisemen are about to release their second album, resonantly entitled Children of a Lesser God. Their first album in 2007 (Wisemen Approaching) and Bronze's solo album in '06 (The Great Migration) together with multiple top notch beats produced for Wu-Tang brethren the last few years, have solidified the Detroit group's reputation for consistent, extremely high quality music. Over the last few years, Bronze and Kevlaar 7 have ascended to the top of my personal list of emcees and beat-makers and so I've eagerly awaited this new material ever since it was announced in the spring of last year. Their new album comes out in stores October 26th but I've managed to secure an early copy. And, somehow, my extremely high expectations have been met. Perhaps exceeded. This album's integration of live instrumentation and almost perfect ratio of quality-to-quantity have built towers above their previous catalogue of craftsmanship. The songs resonate loudly right from the opening title track with pattering live drums and crashed high hats lifting up passionate and eloquent lyrics, and from there the audible satisfaction doesn't fade. It's maintained like an oxygen-fed flame. These guys make albums. Not randomly smattered singles but meaningfully organized songs and themes. There is something good about every track on this album, the two or three interludes included, and on most songs the beat and lyrics are a perfect mix of dopeness. The album features verses from The Wisemen (Bronze and Kevlaar, plus Salute the Kid, Phillie, Illa Dayz, and June Megaladon), Raekwon, Planet Asia, Big Rube of The Dungeon Family, and Beace. It's produced by Bronze Nazareth and Kevlaar 7 with some live instruments thrown in for emphasis by Project Lionheart (and one beat produced by a producer I've never heard of named Supaa Maine). I can't recommend this album highly enough. Take a glimpse at what's great about hip hop right now. 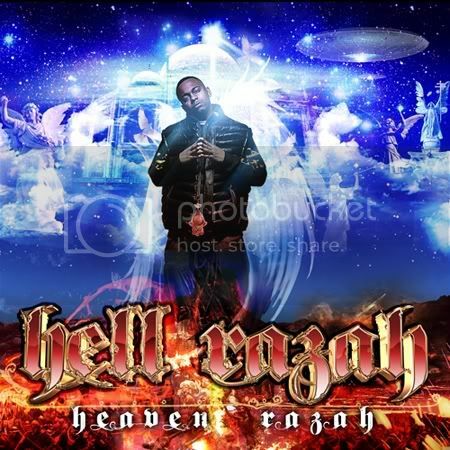 Sunz of Man member and longtime Wu-Tang affiliate Hell Razah also released his second LP (Heaven Razah) recently, interestingly enough he had dropped his first album right around the same time the Wisemen did in '07. Their two new albums go very well together; similar sounds (even a Bronze/Kevlaar beat on the Hell Razah album), themes, great quality, great hip hop music. Razah's album takes a very deep journey, in fact, I would definitely call it a mystical album. He makes great use of symbols, stories and themes from Biblical stories while (somehow) fusing them with angelic alien abduction references and cosmic visuals, all juxtaposed with the streets and all delivered through the medium of melodic hip hop music. It's quite an effort, trust me. What makes it all the more interesting is that, shortly after completing the album, Hell Razah suffered a brain aneurysm that put him into a coma from which he is now still recovering. Don't be confused by what might appear to be strange subject matter, this is some of the best hip hop being made right now and it's definitely worth checking out. Yes there's mystic flights here but when he comes down to earth there are other creative themes like a song entirely devoted to 70s blaxploitation flicks, using characters and scenes from famous films to lyrically display his own movie in a track called "Cinematic" produced by legendary Wu producer 4th Disciple. More to come...let's consider this part one of a much longer post. This is all fantastic stuff, PQ! The information flow in 'Return of the Renaissance' pleased me greatly. I'm way deep in Wu Tang Clan group and member efforts, but I don't really know at all from the farm system. James Joyce is my favorite writer, Wu Tang Clan is my favorite band, and baseball is my favorite past time. You are not alone! Keep up the great work. Thanks alot Bobby, we've gotta collaborate on some kind of project in the future because I've seen your art and you've got serious skills and I know and appreciate what you guys are doing at MLA. Glad to hear your tapping into the same vein, especially that you're into the 3 main things I discuss here. Didn't think anyone else in the world enjoyed that strange combo of things. Stay tuned, I've got a lot more new Wu-Tang-sounding stuff to come in my next few posts. Thanks for checking it out Supaa Maine and I fixed your name in the post, added that extra "a". Congrats on your contribution to this classic album.